At age 24, Elizabeth Miller was a young mother to five-year-old Rebecca. But in the eyes of the British legal system Elizabeth was, first and foremost, an ‘utterer’; a circulator of counterfeit Bank of England paper notes. Three such ‘forged notes of £1 each’ had been discovered ‘in her possess[io]n’ when she was apprehended in Lambeth in 1818 by Constable George Goff. The conscientious constable was later rewarded with the handsome sum of £20 from the Bank of England for his act of law enforcement, while on 2 July 1818 the Bank of England Committee for Law Suits ordered that Elizabeth be prosecuted and fittingly punished for her £3 crime. Seventeen years earlier, they would have made her ‘swing’ for it. Since the 1600s it had been a capital offence to forge Bank of England paper notes and by the 1700s even the act of knowingly circulating them—the practice known as ‘uttering’—carried a certain death sentence. Sentencing for this offence was extreme in order to quash the epidemic of counterfeit notes that had swept the country in the wake of the Napoleonic Wars. However, in May 1801, with a high number of hangings already recorded for the crime of forgery and the recent introduction in 1797 of low denomination notes valued at only one and two pounds, the Bank of England legally introduced a plea bargain to differentiate between major and minor offences. So when Elizabeth and three others were tried on 6 August 1818 at the Surrey Summer Assizes for the offence of uttering, their sentences differed immensely. William West had been discovered with £53 of counterfeit notes and had attempted to dispose of the parcel containing them to conceal his guilt. For this, he hanged. Elizabeth Miller, 18-year-old Jane Wilson, and 23-year-old leather-draper Charles Scott, whose crimes were of a lesser value, however, accepted the newly introduced option of a plea bargain instead. Admitting their guilt spared their lives but it also condemned them to fourteen years transportation. Meanwhile, far beyond the seas and merely a few days after Elizabeth’s arrest, Lachlan Macquarie, the Governor of New South Wales, had laid the foundation stone of a new purpose-built Female Factory at Parramatta. For years, too many women just like Elizabeth—convicts with young children to care for and nowhere to rest their heads each night—had been struggling to find shelter in the utterly deficient 80 by 20 foot (5.5. metre by 6 metre) rooms of ‘The Factory Above the Gaol,’ Parramatta’s first Female Factory, and had resorted to prostitution and theft ‘to supply their necessities.’ Clearly unable to accommodate the convict women already in the colony and concerned he would appear to condone rampant prostitution if he did nothing to remedy the situation, Macquarie ordered the colonial architect, Francis Greenway, to design a ‘Large Commodious handsome stone built Barrack and Factory, three storeys high, with Wings of one storey each for the accommodation and residence of 300 Female Convicts.’ Macquarie’s foundation stone, it was hoped, was a much-needed step towards improved public morality. The new Factory, however, would not be completed for almost three more years. All the while, there were still more women, including Elizabeth and Jane, being given sentences of transportation every day and making their way to the colony on board prison ships. Many letters like this were penned between 1781 and 1827, seeking aid from the very bank the prisoners had acted feloniously against, and the Bank of England did sometimes provide such petitioners with relief, especially to women with children. Elizabeth‘s petition for relief, therefore, was granted ‘in consideration of her having a child to support,’ however, her childless co-petitioner, Wilson, was denied. The decision forced Jane to part ‘with all her clothes for subsistence’ over the coming months until the committee acknowledged her ‘wretched condition’ in January 1819 and ordered Mr Kaye to authorise the payment of two pounds ‘to the Gaoler to be applied for her benefit.’ A few months later, Jane was transported to New South Wales on the Lord Wellington while Elizabeth and five-year old Rebecca had to endure another five months in prison with charitable assistance from the Bank of England to the value of five shillings per week. Elizabeth and Rebecca made the arduous passage to the colony of New South Wales along with 104 other female convicts on the notorious ship the Janus, departing on 23 October 1819. Whereas many convict ships were infamous for considerable loss of life due to disease and shipwreck, the cause of Janus’s infamy was quite the contrary. Upon arrival in Sydney on 3 May 1820 the ship’s population had multiplied, owing to the number of female convicts found to be pregnant to crew members as a result of prostitution on board. With a small child in tow, Elizabeth was not assigned to a master on arrival in the colony but was instead forwarded to the factory at Parramatta. The completion of the second Female Factory was still eight months away when Elizabeth and her daughter Rebecca reached New South Wales, therefore ‘The Factory Above the Gaol’ was the particular incarnation of the institution that confronted Elizabeth and possibly also Rebecca. It was undoubtedly more incommodious than ever due to an ever-increasing convict population and the ever-deteriorating structure of the gaol building. At this stage, many convict women in Elizabeth’s position—even without a child to care for—were likely still prostituting themselves to obtain funds, cohabiting with men for shelter and other basic necessities or, at best, making speedy marriages of convenience. It is not surprising, then, to find that a mere two months after her arrival in the colony, 26-year-old Elizabeth agreed to marry fellow convict, 34-year-old William H. Bennett. 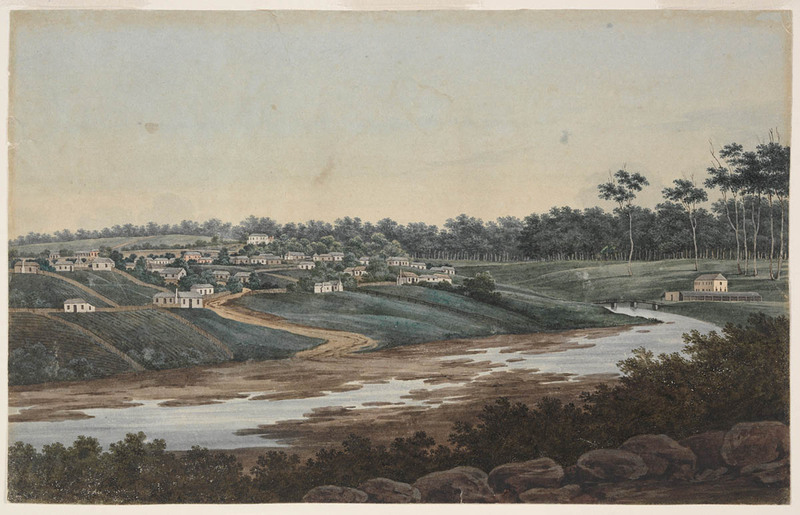 In July 1820, Bennett was based in Parramatta and may have already obtained his ticket of leave. The ticket of leave allowed Bennett certain freedoms including the ability to work for himself long before earning his certificate of freedom at the expiration of his sentence in October 1824. Upon receiving the Governor’s permission to wed, Miller and Bennett married at St John’s Anglican Church, Parramatta in 1820 and Bennett assumed the role of stepfather and guardian to Rebecca. The earliest years of Elizabeth’s life as an assigned convict are unclear, but we know that from 1825 she served part of her 14-year sentence as a servant to Matthew ‘Matt’ Miller, a widowed constable and pardoned convict living at Windsor who had two children. Elizabeth’s assignment to Miller at this time would be significant for several reasons, not the least being Miller’s brutal bashing of his new wife in 1828, for which he was condemned to hang. During Elizabeth’s time as Miller’s servant at Windsor, it seems she had a child with his friend and colleague, George Jilks. Birth records show that a child named ‘William Bennett Jilks’ was born at Windsor on 9 October 1826 to George Jilks, Chief Constable of Sydney, and a woman recorded only as ‘Elizabeth’ – the name of Jilks’s spouse was ‘Maria,’ while the name of Elizabeth’s husband was ‘William Bennett.’ What is particularly noteworthy, however, is that William Bennett Jilks may not have been the couple’s sole issue and, even more surprisingly, may not have been their first. Suspicions regarding Jilks’s links to Elizabeth and Rebecca were raised further when Jilks’s wife, Maria, was cross-examined and she paused significantly before replying to the question of whether she had ever referred to Rebecca as Miss Jilks: ‘I might, perhaps, have called her so, at my own house, when talking to the children, but never since she has grown up.’ With Rebecca’s birth year estimated as 1813 and Jilks’s conviction in September 1814 and transportation in May of 1816 on the Mariner, Jilks could have been her biological father as others had obviously insinuated. The court case revealed that the people who knew the families well not only entertained the idea that Jilks was Rebecca’s father but also voiced this theory, seemingly indicating it was already common knowledge that Jilks and Elizabeth had a male child together in Windsor. In any case, the connection between the Jilks and Bennett families was always strong because a six-year-old girl named ‘Margaret,’ a daughter of George Jilks, was a resident at Bennett’s bakery at the time the 1828 census was taken. Despite having been married since 1820, the Bennetts did not have their first child together until 1829; a daughter christened Elizabeth Ann followed by a son, William H. Bennett Jnr., born circa 1831 at Bennett’s Parramatta home and bakery. Elizabeth was roughly 38 years old when her 14-year sentence was due to expire in August 1832. While tickets of leave and certificates of freedom were published in the newspaper from around 1825 onwards, to date, no record of her emancipation has been recovered there or in the official records. Two months prior to what should have been her emancipation date, Elizabeth’s husband brought a court case against St John’s Tavern publican Thomas Brett for leaving her daughter Rebecca a jilted bride. In addition to revealing Jilks as the likely father to Elizabeth’s daughter Rebecca, the court proceedings revealed that the Bennetts were wealthy enough in 1832 to have spent £1,000 on a wedding for Rebecca that never eventuated. The respectable baker’s wife and matriarch in early nineteenth-century Parramatta was a far cry from the young woman apprehended for the comparatively paltry sum of £3 who had to pray and beg the Bank of England for some charity while she was incarcerated with her small child on Horsemonger Lane. The significant change in fortune Elizabeth enjoyed was due in no small part to the success of her husband, William. By the time he was emancipated in October 1824 Bennett had already established himself as a baker and had made enough headway to set up his home and business at the three heritage-listed Georgian cottages on the corner of O’Connell and Hunter Streets, later known as the Travellers’ Rest. Eventually he held the title to the O’Connell street frontage for that entire block on which he extended his business with a new purpose-built bakery, and also had a farm in Windsor. In a few short years, he was looked upon as one of the town’s eminent and respectable bakers and landowners and was even master to a number of convicts, including Charles Stephens and John Davis, who were assigned to labour in his bakery. In spite of the breach of marital promise committed by the ‘fickle swain’ Thomas Brett against Rebecca, Elizabeth lived to see both her daughters married. However, on 19 October 1847, just seven months after the wedding of eighteen-year-old Elizabeth the younger to Charles Smith, commander of the Woodlark, Elizabeth the elder, ‘the beloved wife of Mr William Bennett’ passed away in her fifties, ‘leaving a disconsolate husband and family to deplore their loss.’ Her final resting place was St John’s Cemetery, Parramatta, located on the same street and only metres from the Bennetts’ home and bakery. Construction of the Female Factory had commenced around the same time Elizabeth had committed her crime, so it is rather fitting that only a few months after Elizabeth’s demise the Parramatta Female Factory institution also came to an end. Though so much about Elizabeth’s life pointed to her becoming one of the Female Factory’s many recurring residents, it appears her brief stay at the institution on her arrival in the colony was her only encounter with the Factory system, thanks to her fortunate marriage to Bennett. Elizabeth’s fellow utterer, Jane Wilson, did not fare so well in her choice of colonial mate and it appears to have made all the difference. Both had been young women when they were convicted, they had committed the same crime, were sentenced on the same day and given the same punishment, yet a decade into their colonial lives, Elizabeth’s husband’s bakery was on the rise while her old cellmate at Horsemonger Lane was among the many convict women recorded as a resident of the Female Factory — a stark reminder of how different things might have been for Elizabeth and her daughter Rebecca. Thirteen years after Elizabeth’s death, her burial plot also became the final resting place for the husband whose industriousness ensured she never did become a frequent resident of Parramatta’s notorious Female Factory. Bank of England Committee for Law Suits Minutes, (London: Bank of England, 1802–1908). Archive Number: M5/307–342. http://www.bankofengland.co.uk/archive/Pages/digita lcontent/archivedocs/commlawsuits/commlawsuits.aspx, accessed 20 August 2014. An earlier version of this paper entitled “Elizabeth Agnes Miller” was published on The Dictionary of Sydney in 2015. ‘Elizabeth Miller,’ Home Office: Criminal Registers, Middlesex and Home Office: Criminal Registers, England and Wales, Class HO 27 Piece 16, (The National Archives of the UK (TNA), Kew, Surrey, England), p.1249; ‘Elizabeth Miller,’ Home Office: Convict Transportation Registers, Class HO11, Piece 3, (The National Archives of the UK (TNA), Kew, Surrey, England). ‘William West: Wm. West apprehended at Barnes Surry for uttering 4 forged bank notes of £1 each, and having in his possession 2 others of £5 each and 39 of £1 each were found in a parcel supposed to have been thrown away by him, as the said notes exactly corresponded with those uttered by him. Ordered to be prosecuted,’ Bank of England Committee for Law Suits Minutes, 1818, Book 2 (London: Bank of England, 1818), p.182, http://www.bankofengland.co.uk/archive/Documents/archivedocs/commlawsuits/18161825/cls0705181827081818b2.pdf, accessed August 2014. Regarding the outcome of his trial, see ‘William West,’ Home Office: Criminal Registers, Middlesex and Home Office: Criminal Registers, England and Wales, Class HO 27 Piece 16, (The National Archives of the UK (TNA), Kew, Surrey, England), p.1249. Charles Scott, originally a leather draper of Horsely Down, Bermondsey, London England; see Bank of England Committee for Law Suits Minutes, 1818, Book 2 (London: Bank of England, 1818), p.173; for discussion of his case by the Committee for Law Suits recommending his prosecution and that he should be allowed to plead guilty to the minor offence, see Bank of England Committee for Law Suits Minutes, 1818, Book 2 (London: Bank of England, 1818), http://www.bankofengland.co.uk/archive/Documents/archivedocs/commlawsuits/18161825/cls0705181827081818b2.pdf, accessed 20 August 2014. ‘Charles Scott,’ Home Office: Settlers and Convicts, New South Wales and Tasmania, HO10, Piece 43, (The National Archives of the UK (TNA), Kew, Surrey, England). Scott was transported per Surrey on 29 September 1818, arrived in 1819 and was assigned to ‘public works’ in Tasmania. His certificate of freedom was granted 29 November 1832 and he married a convict named Mary Williams in Hobart in 1835. Lachlan Macquarie, ‘Appendix to the Report of Major General Lachlan Macquarie, late Governor of the Colony of New South Wales, being A List and Schedule of Public Buildings and Works erected and other useful Improvements, made in the Territory of New South Wales and its Dependencies, at the expence [sic] of the Crown from the 1st of January, 1810, to the 30th of November, 1821,’ 30 November 1822, ‘Enclosure marked A,’ in J.T. Bigge, Report of the Commissioner of Inquiry into the State of the Colony of New South Wales, (New South Wales: House of Commons, 1822) accessed 24 June 2015; Terry Kass, Carol Liston, and John McClymont, Parramatta: A Past Revealed, (Parramatta: Parramatta City Council, 1996), pp.97–9. ‘Jane Wilson,’ Home Office: Convict Transportation Registers, HO11, Piece 3, (The National Archives of the UK (TNA), Kew, Surrey, England). ‘Elizabeth Miller,’ Home Office: Convict Transportation Registers, HO11, Piece 3, (The National Archives of the UK (TNA), Kew, Surrey, England). ‘Elizabeth Miller,’ Home Office: Settlers and Convicts, New South Wales and Tasmania, HO10, Piece 14, (The National Archives of the UK (TNA), Kew, Surrey, England); ‘Elizth Miller,’ Home Office: Settlers and Convicts, New South Wales and Tasmania; HO10, Piece 20, (The National Archives of the UK (TNA), Kew, Surrey, England);.’Elizabeth Miller,’ New South Wales Government, Musters and other papers relating to convict ships, Series CGS 1155, Reels 2417-2428, (State Records Authority of New South Wales, Kingswood, New South Wales, Australia); ‘Elizabeth Miller,’ New South Wales Government, Bound manuscript indents, 1788–1842, NRS 12188, Item [4/4007], Microfiche 644, (State Records Authority of New South Wales, Kingswood, New South Wales, Australia). Joy Damousi, Depraved and Disorderly: Female Convicts, Sexuality and Gender in Colonial Australia, (Cambridge: Cambridge University Press, 1997), pp.11–2. The Parramatta Female Factory Friends’ list of Female Factory inmates, compiled by Anne Mathews and Beth Matthews, confirms that Elizabeth Miller per Janus had indeed been admitted to the institution. Women with children were typically sent to the Factory on arrival, so it is most likely that this was when Elizabeth entered the Factory system, as opposed to a later secondary offence committed in the colony. The convict muster for 1822 indicates William Bennett had a ticket of leave and his occupation as ‘baker,’ but since it does not indicate when he received his ticket of leave, it is possible he had it much earlier and was already setting himself up as a baker as early as 1820 when he was requesting permission from the Governor to marry Elizabeth. See ‘William Bennett,’ Home Office: Settlers and Convicts, New South Wales and Tasmania, HO10, Piece 36, (The National Archives of the UK (TNA), Kew, Surrey, England). ‘Elizabeth Miller,’ New South Wales Government, Copies of letters sent and received, mainly within the Colony, or ‘Document Books Nos.1-3’, c.1817-25, Series 901, Fiche 6016-6017, (State Records Authority of New South Wales, Kingswood, New South Wales, Australia). Marriage of Elizabeth Miller and William Bennett, Parish Marriage Registers, Textual records, St. John’s Anglican Church Parramatta, New South Wales, Australia. The Convict Musters for 1822 and 1825 list Rebecca as ‘Rebecca Bennett’ and that she is his daughter. ‘Bennett: General Muster,’ (1822), Home Office: Settlers and Convicts, New South Wales and Tasmania, HO10, Piece 36, (The National Archives of the UK (TNA), Kew, Surrey, England); ‘Rebecca Bennett: General Muster A–L,’ 1825, Home Office: Settlers and Convicts, New South Wales and Tasmania, HO10, Piece 19, (The National Archives of the UK (TNA), Kew, Surrey, England). In 1822, under the ‘By whom or where employed’ column on the convict muster, it merely states ‘Wife of Wm. Bennett, Parramatta,’ ‘Elizabeth Miller: General Muster,’ 1822, Home Office: Settlers and Convicts, New South Wales and Tasmania; HO10, Piece 36, (The National Archives of the UK (TNA), Kew, Surrey, England). ‘Elizabeth Miller’, General Muster, 1825 Home Office: Settlers and Convicts, New South Wales and Tasmania, HO10, Piece 20, (The National Archives of the UK (TNA), Kew, Surrey, England); ‘Matt Miller’, Population Book, 1814, New South Wales Government, Secretary to the Governor, Population musters, New South Wales Mainland (1811–1819), Series: NRS 1260; Reel: 1252, (State Records Authority of New South Wales, Kingswood, New South Wales, Australia). Muller was of no relation to Elizabeth as his colonial appellation was an Anglicised version of his German name, Matthias Muller. ‘Mathias Miller’, General Muster, 1811, Home Office: Settlers and Convicts, New South Wales and Tasmania, HO10, Piece 5, (The National Archives of the UK (TNA), Kew, Surrey, England); ‘Matthias Miller,’ July 1820, New South Wales Government, Memorials to the Governor, 1810-25, Series 899, Fiche 3001-3162, (State Records Authority of New South Wales, Kingswood, New South Wales, Australia). William Bennett Jilks, full birth record transcript, Early Church Record Baptisms (NSW: NSW Registry of Births, Deaths and Marriages), Number: 372 V11, Volume Number: V18268128 1C; Australia Birth Index, 1788–1922 (Provo, UT, USA: Ancestry.com Operations Inc, 2010); Note: William Bennett Jilks was baptised on the 19 August 1827 by minister John Cross in the parish of Windsor. ‘Geo Gilkes,’ Date of Trial: 16 September 1814; Location of Trial: Middlesex, England; Crime: Larceny; Sentence: Transportation. See Home Office: Criminal Registers, Middlesex and Home Office: Criminal Registers, England and Wales, Series HO 26, Piece 20, p.44 (The National Archives of the UK (TNA), Kew, Surrey, England); Old Bailey Proceedings Online (www.oldbaileyonline.org, version 7.2, 15 August 2014), 14 September 1814, trial of GEORGE GILKES, JOHN RADLEY, (t18140914-49), accessed 15 August 2014. An ‘Elizabeth Miller’ was convicted at Middlesex County in 1812 for larceny and sentenced to three months imprisonment. Date of Trial: 28 February 1812; Place of Trial: Central Criminal Court, Middlesex England; Sentence: Imprisonment. ‘Elizabeth Miller,’ Home Office Criminal Registers, Middlesex and Home Office: Criminal Registers, England and Wales, Series HO 26 Piece 48, (The National Archives of the UK (TNA), Kew, Surrey, England), p.133. Maria Jilks née Jones, also a former convict. Maria had a life sentence but received a pardon. ‘George Jilks,’ Vessel: Mariner, Home Office: Settlers and Convicts, New South Wales and Tasmania, HO10, Piece 1/1, (The National Archives of the UK (TNA), Kew, Surrey, England). New South Wales Government, 1828 Census: Householders’ returns, (Population and Statistics, Musters and Census Records, Census, Colonial Secretary), Series 1273, Reels 2551-2552, 2506-2507, (State Records Authority of New South Wales. Kingswood, New South Wales, Australia). Jane Wilson married a convict with a life sentence named William Quinland (arrived per Tyne). Quinland was employed to ‘split posts’ while Jane was either employed to work at the Parramatta Female Factory or was incarcerated there as she appears as a resident of the Factory in the 1828 Census. The census also reveals Jane had begun to use an alias: ‘Charlotte Quinland.’ With this alias, Jane attempted to marry a second man while still married to Quinland, but after seeking permission from the Governor to marry, she was denied on the basis that there was no record of a ‘Charlotte Quinland’ on the Lord Wellington‘s list of convict passengers; see 1828 Census: Householders’ Returns, Series NRS 1273 Reel 2552, (Kingswood, New South Wales, Australia: State Records Authority of New South Wales). According to the 1828 Census, Charles Stephens was then 18 years old and had been transported with a 7-year sentence on the convict ship Prince Regent in 1827 while John Davis was 28 years old with a 14-year sentence and came to Australia per Florentia in 1828. See 1828 Census: Householders’ Returns, Series NRS 1273 Reel 2552, (Kingswood, New South Wales, Australia: State Records Authority of New South Wales). fickle swain: a capricious admirer or suitor, willing to trifle with a young woman’s affections. Buried in Section 2, Row F, No.1 at St John’s Cemetery, Parramatta. Judith Dunn, The Parramatta Cemeteries: St. John’s (Parramatta: Parramatta and District Historical Society, 1991), p.109; Parish Burial Registers, Textual Records, St. John’s Anglican Church, Parramatta, New South Wales, Australia.